Last week was the Canadian Thanksgiving long weekend and I was originally planning on making a vanilla bean cheesecake with a wild blueberry compote. However, my baking plans changed while shopping at Wal-mart and stumbling across a 3-pack of Philadelphia’s Chocolate Cream Cheese with a yummy recipe on the side. I was instantly sold, though I still plan to that vanilla bean cheesecake for another occasion. I honestly don’t know of anyone who doesn’t like cheesecake. The recipe was super easy to follow, just butter, chocolate cookie crumbs, eggs and sugar. What makes this recipe so simple is that the chocolate is already part of the cream cheese,so half the work is already done for you. 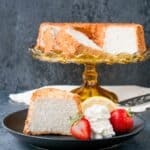 This cheesecake will take you less than 1 hour to make from start to finish, just 10-15 minutes of prep, and 40-45 minutes bake time. I added the cinnamon for some flare and I’m so glad I did. The fragrance and taste of the cinnamon mixed with the chocolate is amazing. You can omit the cinnamon if you are not a fan, but I highly recommend adding it. The one teaspoon I added to the batter is just the right amount. It’s not overpowering or spicy, it just adds a heavenly fragrance and taste that pairs so well with the chocolate. The package of 3 is a limited edition, but the single 250g round container is always available. 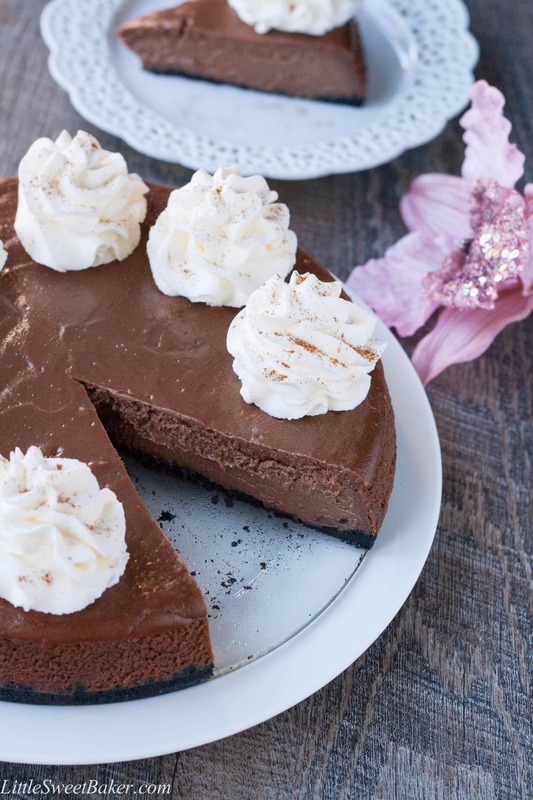 Imagine this, creamy, velvety cheesecake, melting-in-your-mouth as the smooth chocolate flavor caresses your palette. And if that wasn’t enough, you have the aroma of cinnamon stimulating your senses. This cheesecake is so good, I’d even say it’s heavenly. 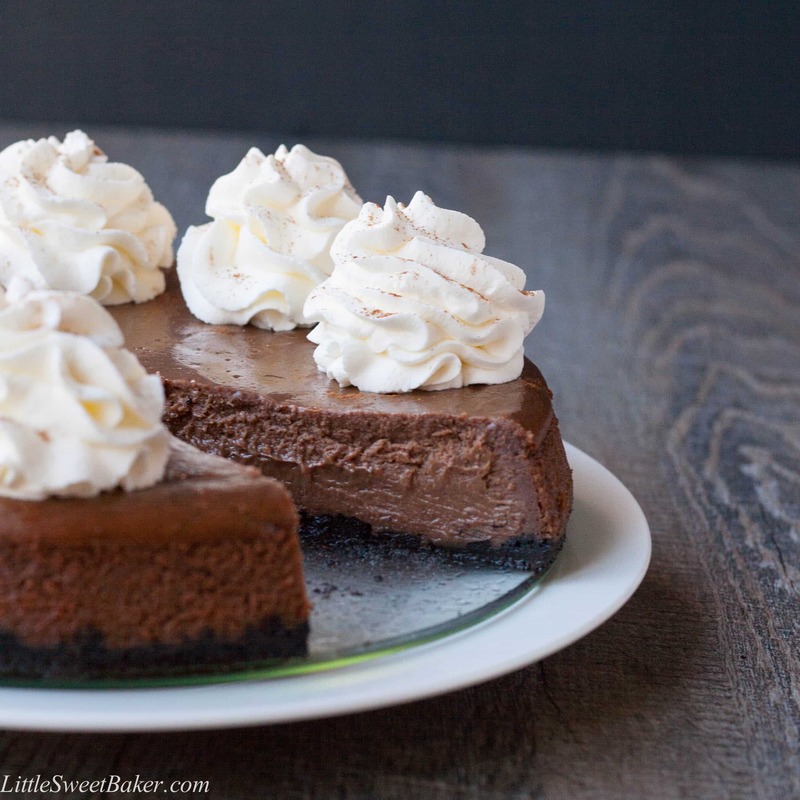 This cheesecake is incredibly chocolaty and velvety-smooth with a hint of cinnamon. Preheat oven to 350°F. Toss the cookie crumbs with the melted butter and press onto the bottom of a 9-inch springform pan. Using a handheld mixer, beat the cream cheese with the sugar and cinnamon until well blended. Add the eggs, one at a time until just combined and smooth. Pour over crust and bake for 40-45 minutes or until the edges looks dull and there is 2-3 inches of the center that is still wobbly. Remove from the oven and run a thin knife around the edges to loosen cake. Cool before removing the rim. Refrigerate for 4 hours. Top with whipped cream and a dusting of cinnamon or cocoa powder before serving. I baked this for my family the other day and they could not stop asking for more! I am planning on making it again for them soon! I’m a fan of your recipes! I’ve tried looking for Chocolate cream cheese in my local stores but con’t find it. For those of us who don’t have Chocolate cream cheese, do you have an alternative method/recipe for adding the chocolate ourselves? Thank you Ester:) You can add 2 ounces of baking chocolate per package of cream cheese. So for this recipe that would be 6 ounces of baking chocolate, melted and mixed in after the eggs. Feel free to email me back if you have any further questions. Enjoy and have a lovely day! 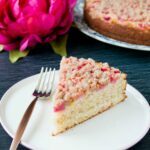 I missed last week and so somehow missed this wonderful post on cheesecake. Cheesecake is my favorite dessert. 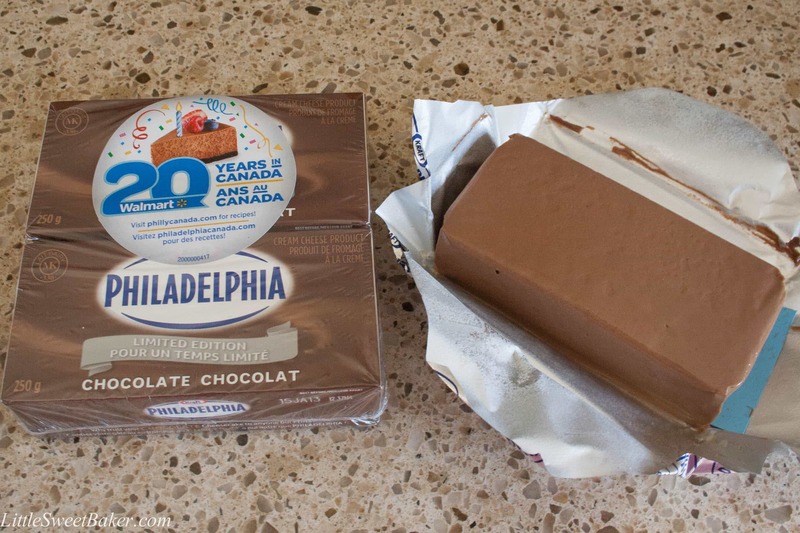 I have never seen chocolate cream cheese at my grocery store …I will look for it especially next time I go shopping. This is surely heaven in a dessert!! I will be making the chocolate cinnamon cheesecake for my youngest son who shares my love of it. Another great recipe Lily!! look at that beautiful cheesecake! looks amazing Lily! i have never seen chocolate cream cheese in grocery stores here, will have to look around! Thanks Manali and I hope you can find the chocolate cream cheese at your local grocery store, its awesome! It looks amazing, Lily! Yumm! Lily! I’m getting hungry for dessert looking at this cheesecake even though I just came back from a housewarming party with lots of food–what’s up with that? I love the addition of cinnamon. Your pictures always look so appetizing and inviting. Have a great weekend! Thank you Lily!! Im happy you like to follow my stories around the World 😀 I appreciate it! Have a nice Sunday! Looks absolutely divine. Happy FF! Thanks Anjana, happy FF to you too! You’re welcome Julianna, happy FF to you too! Oh wowww… this look SOOOO goooood…. the pictures are frame-able! Love it! 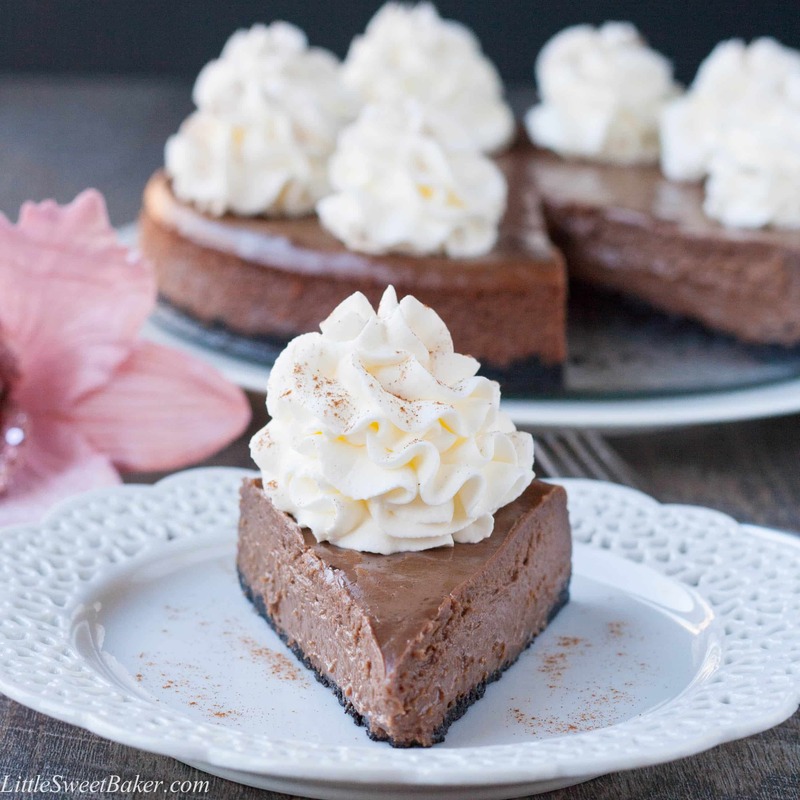 It looks incredible, I love adding cinnamon to chocolate desserts, they pair so well. Sounds easy and I love cinnamon!